March 2017: The Healing Kadi Foundation given permit by the government of Uganda to provide medical services to the refugees in Moyo district, Uganda and orphans in Adjumani district, Uganda. February 2017: The $200,000 grant for delivering clean treated water for the Pediatric hospital and surrounding community through the partnership of The Healing Kadi Foundation and Aqua-Africa was approved by Juba Rotary Club, South Sudan. September 2016: The Healing Kadi Foundation breaks ground on construction of pediatric hospital in Kajo Keji, South Sudan. December 2015: The Healing Kadi Foundation launches an ambitious $500,000 fundraising campaign to build pediatric hospital (first in South Sudan). October 2015: Dr. Lo'diong Jackson, The Healing Kadi Foundation Medical Director in South Sudan, spends six weeks of medical training in the United States. November 2014: The Healing Kadi Foundation sends 20 and 40 feet containers filled with building materials to Kajo Keji, South Sudan. October 2014: The Healing Kadi Foundation completes installation of water tank to insure constant supply of clean water at the Marilyn Miller clinic. June 2013: The Healing Kadi Foundation dedicates the Marilyn Miller Memorial Clinic in Kajo-keji County, South Sudan. July 2013: Julie Cornell’s “Mission to Africa” documentary is the winner of the National Edward R. Murrow award and received an Emmy! July 2012: Three Clinic-In-Can structures are unloaded onto foundations in Kajo Keji, South Sudan. March 2012: Three Clinic-In-Can structures depart from Port of New York for their 9,000 miles journey to Kajo Keji, South Sudan. July 2011: The Republic of South Sudan gains independence from Sudan. July 2011: Three Clinic-In-Can structures are delivered to Omaha, Nebraska. January 2010: The Healing Kadi Foundation receives a $100,000 grant which was used to purchase three Clinic-In-Can structures from Hospitals of Hope in Wichita, Kansas to establish first modern clinic in Kajo Keji, South Sudan. January 2010: The Healing Kadi Foundation is granted 501(c)3 status by the U.S. Internal Revenue Service (IRS). The Healing Kadi Foundation was founded to provide sustainable health care to the people of South Sudan. Dr. Joseph Dumba, Pastor Jeremy Grant, and organizer Mr. Wayne Naro to explore the possibility of regular mission trips and eventually building a hospital. The name The Healing Kadi Foundation is chosen. “Kadi” means “house” or “hut” in the Bari language in South Sudan. 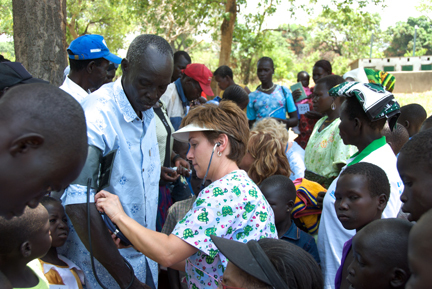 March 2007: 17 member medical mission team is sent to South Sudan by Covenant Presbyterian Church. Mission trip members are overwhelmed by the poverty and basic human needs they witnessed, and vow to work diligently to help the Sudanese people. January 2005: After over 20 years of a bloody civil war, a Peace Accord was signed between the warring parties in Sudan. Hundreds of thousands of war refugees in neighboring countries begin to flood back into South Sudan. The area, which had been ravaged by the lengthy fighting, presented a very difficult life, with no clean water, little infrastructure, and no modern health care.